Last night the temperature dropped to 46 degrees, and it really began to feel like fall — which is when nothing beats a hot meal that is tasty, nutritious, AND easy to make. 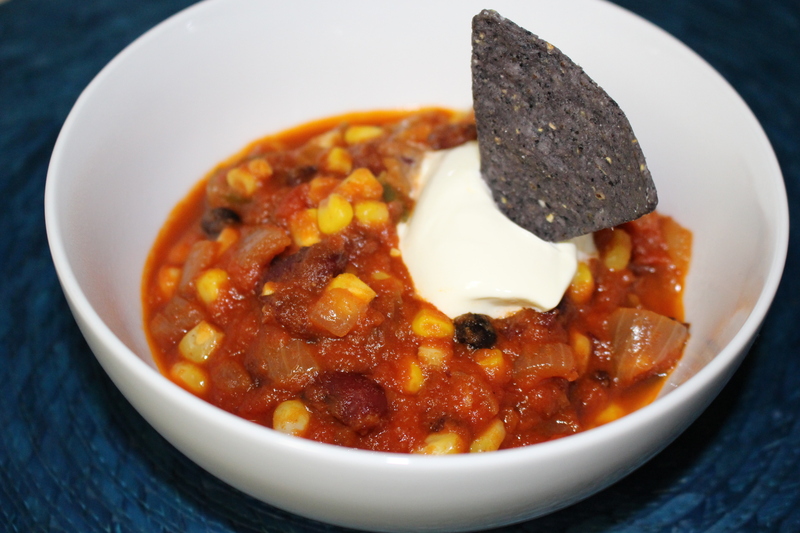 This chili recipe is a family favorite that fits the bill. 2 cups of kidney and black beans. Typically I cook a batch of kidney and black beans together in advance. It’s healthier than opening a can and less expensive. I freeze the cooked beans and then have them on hand for dishes like this one. You can read how I do this here. Coat the bottom of a large pot with olive oil. Toss in chopped onion and let sauté on low heat for a few minutes until soft. Add green pepper and garlic. Let sauté for another several minutes on low heat. Add tomatoes, beans, salt, and chili powder. Let simmer for 20-25 minutes, stirring occasionally. Add corn and continue to let simmer for another 20 minutes. If desired, season to taste with sea salt and pepper. Serve with a slice of homemade cornbread or organic corn chips, and grated grass-fed cheddar cheese or a dollop of organic sour cream (we love the European style cultured sour cream with only two ingredients: cultures and fresh organic cream). Enjoy in good health — and company!